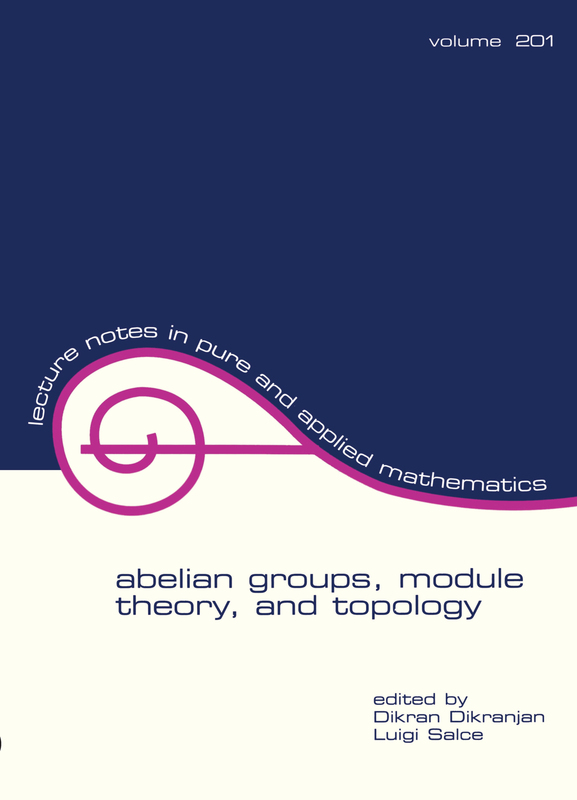 Features a stimulating selection of papers on abelian groups, commutative and noncommutative rings and their modules, and topological groups. Investigates currently popular topics such as Butler groups and almost completely decomposable groups. Research articles: Global Krull dimensions and global dual Krull dimension of valuation rings; The Luroth theorem for some complete valued fields; AB-5 for module and ring extensions; Ko of semiartinian unit-regular rings; Idempotents of the class semigroup of a Prufer domain of finite character; Greatest common divisors generalized; Subgroups of the Baer-Specker group with prescribed endomorphism ring and large dual; Isomorphic automorphism groups of torsion-free p-acid modules; A theorem on extensions of bimodules; Communicative rings with acc on irreducible ideals; Self linearly compact rings and dualities; Extensions of compact Abelian groups by discrete ones and their duality theory II; A note on quasi-duality endomorphism, rings of modules whose cardinality is cofinal to Omega; Endomorphism rings and automorphism groups of separable torsionfree modules over valuation domains; Torsionless modules and rings with finite essential socle; Building noetherian domains inside an ideal-adic completion; G-minimal topological groups; An adjointness relation for finite partition lattices; The variety of topological groups generated by the class of all Banach spaces; On thin generating sets in topological groups; Abelian topological groups without irreducible Banach representations; Cyclic modules over end (Vp) whose endomorphism ring is an ultrapower of D; Automorphisms that determine an Abelian p-group; Dualities and pure-semisimple rings; Suitable sets in products of topological groups and in groups equipped with the Bohr topology; On a duality with less than usual reflexive abstract modules; The Roelcke compactification of unitary groups; Tilting in module categories. (Part contents).